The 21:9 ratio is the perfect professional fit for software engineers, video / sound editors, and graphic designers. Imagine 2 conventional high quality monitors attached for multi-tasking, but their screens connect and extend seamlessly. Now you can use a program with long-range panoramic view in full length, without any bezel in the middle or dragging cursors. No longer divide your focus into separate monitors, the 29UB55 is the perfect companion for your profession. dimensions 12.9" x 27.7" x 1.7"
The 21:9 ratio is the perfect professional fit for software engineers, sound & video editors, and graphic designers. The widescreen seamlessly connects two separate work areas for easy comparison and multi-tasking on one monitor. Long-range panoramic viewing is full length, without any bezel in the middle or dragging cursors. 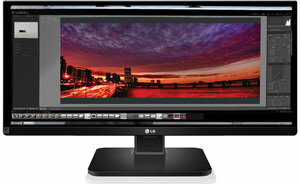 21:9 Full Screen or 2560 x1080 Resolution is dependant on content, device, interface or graphic card. The 29-inch display with a 21:9 UltraWide Full HD (2560x1080) provides an efficient environment for using Microsoft Office programs such as Word, Excel and OneNote. The 21:9 UltraWide Full HD shows 9 more columns compared to conventional 16:9 monitor in excel, allowing you to see all the contents in full view without scrolling to see hidden columns or rows and increasing your work efficiency. 21:9 Full Screen or 2560 x1080 Resolution may not work depending on content, device, interface or graphic card. The 29UB55’s Height Adjustment feature allows up/down monitor adjustments for a comfortable work environment. Connect two devices to a single monitor with Dual Link-up that allows an HDMI + HDMI link. Collaborate with colleagues by simply connecting each other’s devices to this single monitor to share and compare information. Freely show and control the screen while watching your partner doing the same on the opposite side of the monitor. No need to install annoying projectors in small rooms or worry if a conference room is occupied. Dual Link-up requires a specific combination of HDMI/DisplayPort/DVID (Dual link) connection with each device. With its wide screen ratio, 4 programs can be opened on a single screen for at-a-glance comparison. The 4-Screen Split software includes an autofitting function. With a simple drag or a double click, a new window will automatically fit into the marginal room of the screen. The 21:9 screen’s large space is a perfect environment for efficient multi-tasking, and has the ability to open and run an editing program and its source clip folder without minimization. The size of the sub-screens, which can be split into 2 to 4 areas, are user-controlled. The 29UB55 is compatible with Mac and not only provides convenience but also productivity in a single click. 4-Screen Split software requires DVI-D (Dual Link), DisplayPort or HDMI connection with Windows XP/Vista/7/8 or Mac OS X 10.7 (Lion)/10.8 (Mountain Lion)/10.9 (Maverick). Protect your eyes from exhausting flickers and blue light emissions. LG’s new Flicker Safe technology reduces the flicker level to almost zero. Activate Reader Mode to minimize harmful blue light emissions with a simple touch of a hot-key while working, gaming, or watching movies without burdening your eyes. 27.7" x 10.2" x 14.8"
27.7" x 1.7" x 13.0"
30.6" x 7.6" x 15.9"